Engelbart was a visionary who believed that the most effective way to solve problems was to augment human abilities and develop ways of building collective intelligence. Computers, in his view, were “power steering for the mind” – tools for augmenting human capabilities – and this idea of augmentation has been the backbone of the optimistic narrative of the tech industry ever since. Are humans smarter than frogs? And then the penny dropped (I am slow on the uptake). I realised that what I had been doing was adding to a dataset for training the machine-learning software that guides self-driving cars – probably those designed and operated by Waymo, the autonomous vehicle project owned by Alphabet Inc (which also happens to own Google). So, to gain access to an automated service that will benefit financially from my input, I first have to do some unpaid labour to help improve the performance of Waymo’s vehicles (which, incidentally, will be publicly available for hire in Phoenix, Arizona, by the end of this year). Neat, eh? But note also the delicious additional irony that the Captcha is described as an “automated Turing test”. The Turing test was conceived, you may recall, as a way of enabling humans to determine whether a machine could respond in such a way that one couldn’t tell whether it was a human or a robot. So we have wandered into a topsy-turvy world in which machines make us jump through hoops to prove that we are humans! Brett Frischmann, co-author of Re-engineering Humanity in an interview with the Economist. Cognitive Dissonance in Silicon Valley? Or maybe they know something we don’t? The futurist philosopher Yuval Noah Harari worries about a lot. But lately, Mr. Harari is anxious about something much more personal. If this is his harrowing warning, then why do Silicon Valley C.E.O.s love him so? Could it be that they’re not that concerned about his warnings that digital tech is dangerous for democracy because, basically, they’ve given up on it? Here’s an edited version of a chapter I’ve written in a newly-published book – Anti-Social Media: The Impact on Journalism and Society, edited by John Mair, Tor Clark, Neil Fowler, Raymond Snoddy and Richard Tait, Abramis, 2018. Ponder this: in 2004 a Harvard sophomore named Zuckerberg sits in his dorm room hammering away at a computer keyboard. He’s taking an idea he ‘borrowed’ from two nice-but-dim Harvard undergraduates and writing the computer code needed to turn it into a social-networking site. He borrows $1,000 from his friend Eduardo Saverin and puts the site onto an internet web-hosting service. He calls it ‘The Facebook’. 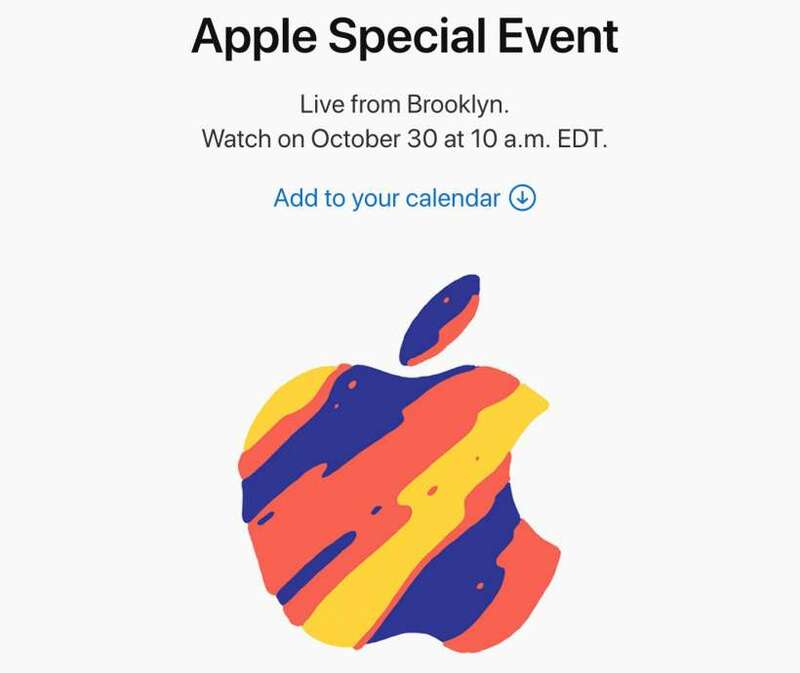 Like most of my peers in the tech-commentary business, I generally tune into the twice-yearly events at which senior Apple executives reveal the latest wonders to emerge from the creative imagination of Jony Ive. Part of the entertainment value of these gabfests is seeing grown billionaires talking like teen tech worshippers (everything is ‘incredible’ or even ‘fantastic’; the company exists to help customers to enhance their innate ‘creativity’ with new products that we will all ‘just love’, etc). But usually, buried in the superheated hoopla there’s the odd genuinely interesting new thing. But this week’s event — which was held in New York rather than San Francisco (itself a first, I think) — was strangely dull. There’s a new MacBook Air, but actually it’s hard to see why it’s needed. The new one has a Retina screen, but I can’t see why anyone would get excited just about that when the underlying hardware is much the same as before. And, overall, Apple’s laptop lineup looks strangely incoherent. The two big announcements, to judge from the presentations, were a substantially enhanced Mac Mini and a new iPad Pro. The new Mini is welcome because for many of us it’s the most useful little workhorse that Apple has ever produced. And the new iPad is clearly a a serious upgrade of a product that’s already way ahead of the competition. But here’s the rub. I’ve had an iPad Pro since the product was first launched, and it’s the most useful — and usable — device I’ve ever owned. In combination with the Apple Pencil it has entirely replaced the paper notebooks that I’ve always used up to now. It goes everywhere with me, does exactly what I need a tablet to do, and does it very well. So no matter how fancy the new iPad ( and its enhanced Pencil) is, I have no rational reason to consider upgrading. These big Apple events are often — and justly — ridiculed for being just revivalist meetings for the Church of Apple. Tim Cook & Co are always preaching to the choir. And, since I’m a long-term Apple user, I could be regarded as one of the above. But if even a hardened user can find no reason to upgrade, what’s the point of all the hoopla? Perhaps. But maybe we’ve arrived at what Charles calls — “a sort of tech stasis”. Many of the things we have are now Good Enough, and so despite Moore’s Law and the wonders of computational photography, etc. we don’t need to upgrade them every year, or every two years. If that’s indeed what’s happening, then what are the implications for tech companies that are hooked on planned obsolescence to a degree that even General Motors in its heyday couldn’t dream of? Gab, a “free speech” alternative to Twitter that’s popular with the far right, has been shut down after losing service from a number of mainstream technology platforms, including PayPal, Joyent, Medium, and GoDaddy. 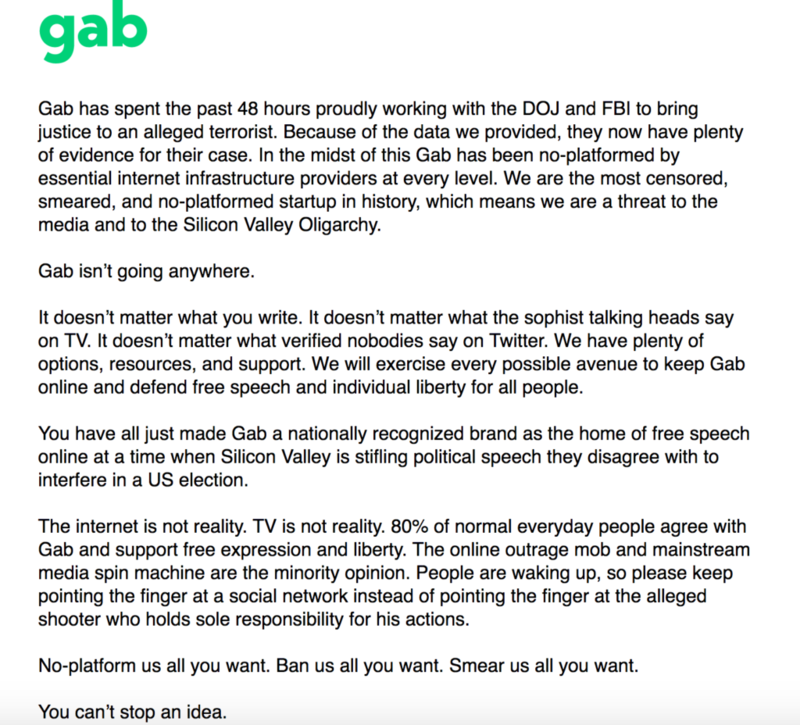 “Gab is under attack,” the company’s home page now reads. “We have been systematically no-platformed by App Stores, multiple hosting providers, and several payment processors.” Gab is working to get back online using new service providers. the existence of Gab reflects a larger trend on the right, wherein those banished from mainstream social-media sites create evermore extreme platforms on which to express themselves. Fox News initiated this trend more than two decades ago: the cable channel was explicitly founded to offer a conservative take on the news, while Andrew Breitbart built his namesake site to cater to an even more conservative audience. The bigger the Internet has become, and the lower the cost of entry, the more likely sites like Gab.com and those further afield will proliferate—not just as social hubs, but as an alternate Internet with its attendant-support networks. The deeper problem here is about what the Internet has revealed about humans. I’ve argued for a long time that one way of interpreting it is to think of the network as holding up a mirror to human nature. Much of what we see in it is uplifting, informative, inspirational and/or banal — unproblematic, in other words. But the mirror also reflects many of the ugliest sides of human nature, and the technology gives expression to that in ways that has real-world effects. Which is why the riposte that all those ugly sides of human nature already existed in the pre-Internet age rather loses its force: in earlier times, this ugliness was more localised and generally had limited traction (though of course there were genocidal exceptions). Now it can find expression anywhere. Until 2016, Cesar Altieri Sayoc Jr.’s life on social media looked unremarkable. On his Facebook page, he posted photos of decadent meals, gym workouts, scantily clad women and sports games — the stereotypical trappings of middle-age masculinity. But that year, Mr. Sayoc’s social media presence took on a darker and more partisan tone. He opened a new Twitter account and began posting links to sensational right-wing news stories, adding captions like “Clinton busted exposed rigging entire election.” On Facebook, his anodyne posts gave way to a feed overflowing with pro-Donald Trump images, news stories about Muslims and the Islamic State, far-fetched conspiracy theories and clips from Fox News broadcasts. By the time he was arrested in Florida on Friday, charged with sending pipe bombs to at least a dozen of President Trump’s critics, Mr. Sayoc appeared to fit the all-too-familiar profile of a modern extremist, radicalized online and sucked into a vortex of partisan furor. In recent weeks, he had posted violent fantasies and threats against several people to whom pipe bombs were addressed, including Representative Maxine Waters, a California Democrat, and former Vice President Joseph R. Biden Jr. His vehicle, a white van plastered with right-wing slogans, came to resemble a Facebook feed on wheels. So he went from posting pictures of women, real estate, dining and cars to posting pictures of ISIS, guns and people in jail — and then to posting mail-bombs to prominent Democrats.